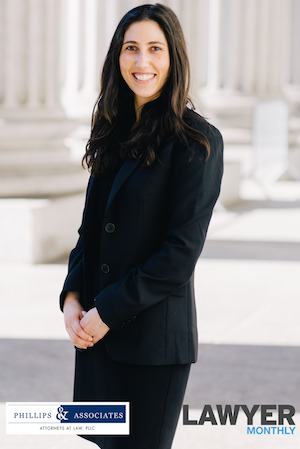 Recently, Lawyer Monthly interviewed Brittany Alexandra Stevens, a New York City employment attorney at Phillips & Associates. Ms. Stevens is a passionate litigator who was recognized this year as a Rising Star by New York Super Lawyers. This year, she was also recognized as a "Best Attorney" by the American Institute of Legal Counsel and the Best Attorneys of America Association. She has also been added as a member of the prestigious Million Dollar Advocates Forum, in which she is recognized as one of America's top trial lawyers. Ms. Stevens represents clients who experience sexual harassment in the workplace or in a public accommodation. She explained that sexual harassment is a type of gender discrimination that takes many forms. It can include touching, asking for sexual favors, or making sexual comments. It can be perpetrated by men or women, and by supervisors as well as coworkers. In order to be actionable, it usually needs to involve unwelcome conduct that is more than petty or trivial actions or words. Speaking about the #metoo social media movement, Ms. Stevens explained that she hopes that the conversations sparked by the movement will positively affect employees' lives. She noted that many more individuals are now calling the firm about prior acts of sexual harassment, rather than present harassment. Ms. Stevens provided three crucial points that she remembers when handling a sexual harassment lawsuit. The first is to be compassionate regarding the devastating impact on an individual who has been sexually harassed. Sexual harassment can cause tremendous discomfort, and it may even result in physical problems that necessitate medical aid. Second, there is no formula for handling sexual harassment claims. Each situation is unique and mandates that Ms. Stevens approach it differently in seeking the best possible results. In order to ensure that she chooses the right approach, the details of each client's case are taken down. Each client has a different story and also has different needs. While some clients want to be closely involved in their lawsuits, others would prefer not to be so closely involved. Third, there is no way to take back the sexual harassment, nor is there any amount of money that can fully compensate a plaintiff for what happened. Attorneys in these cases must usually aim for a monetary recovery that consists of lost wages. In some instances, it is possible to obtain a noneconomic recovery in the form of reference letters to secure another job, a transfer, or counseling. Ms. Stevens explained that there can be significant hurdles to proving sexual harassment. Often, clients do not have any evidence beyond their word to establish sexual harassment, since it is rare for sexual harassment to occur in an open forum. The jury may need to decide the merits of a case based on how credible the witnesses are. On behalf of a plaintiff who is her client, she will need to establish that there was sexual harassment and that the corporation or the individual defendants should be accountable for it. An attorney may be able to meet the burden of proof by submitting emails, texts, or other evidence. Ms. Stevens talked to the interviewer about the common fear of retaliation. Often, employers possess substantial power over the trajectory of an employee's career. An employee may be scared of being fired, transferred, not promoted, or having a public complaint. An employee may be worried about looking like a troublemaker or getting a negative reputation. It is illegal for employers to fire or otherwise retaliate against an employee. Complaining about harassment is a protected activity under the law. Ms. Stevens is a skillful and well-respected employment litigator. If you have been harmed by sexual harassment or other violations of your rights in a New York City workplace, you should consult us. You can contact Phillips & Associates at (212) 248-7431 or through our online form. We handle employment litigation in the Bronx, Queens, Brooklyn, and Manhattan, as well as Nassau, Suffolk, and Westchester Counties, and in New Jersey.